2.6 cm high without handle, 3.1cm high including handle. A small but neatly decorated Roman Oil lamp, with obvious signs of some use and wear. 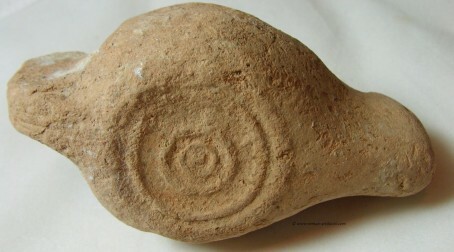 The top has two concentric rings surrounding the center image, which is that of the God Mercury (see similarity below to a Roman Carving). The front of the oil lamp has a phalic shape, while the handle also has two decorative lines running down it. 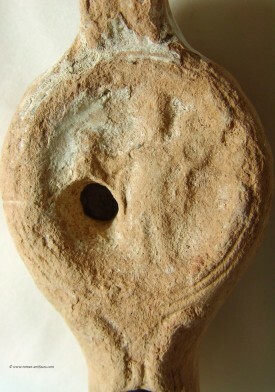 The underside of the lamp has numerous raised circles, much like a modern frying pan has. This lamp could very easily have been used to light a small alter or similar religious area in a Roman household. The depiction of the God Mercury on the top is indicative of this, as is the fact that this lamp obviously pre-dated the entry of Christianity into the Roman Empire in the early 4th Century. 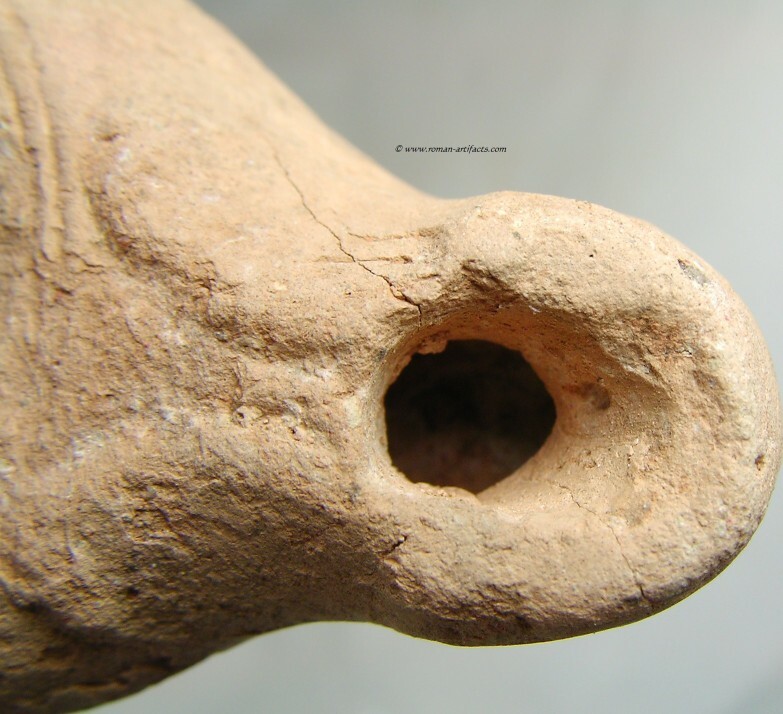 The oil lamp was in use in the ancient world for thousands of years and saw continued and heavy use during the Roman period. Varieties ranged from ornately decorated bronze ones, to sammian pottery ones to more simple ones. They could be carried by hand or placed in proper locations to light the interior of a house. Many were also used at alters and temples, such as was possible with this piece because of the depiction of Mercury in the center. The lamp was made by putting two molded pieces of clay together and then letting it harden. After that the two holes were put in to allow the lamp to be filled with oil and for the wick to be placed inside. The lamp would then be fired for up to two days until it was ready for use. 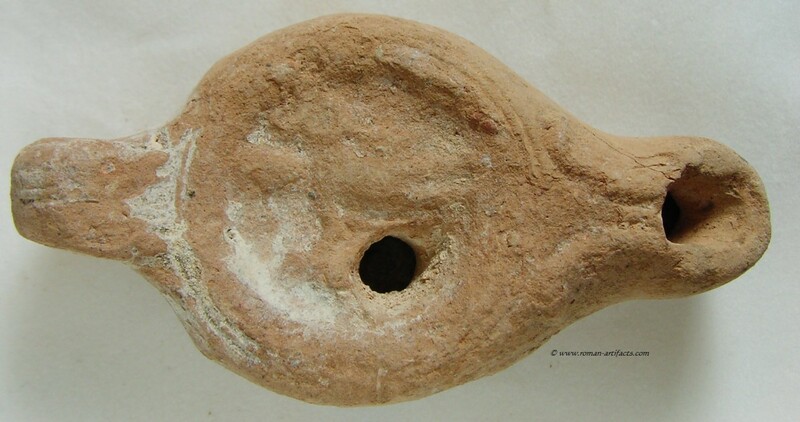 The lamp would be lit by putting a long wick inside the hole at the tip of the lamp. The interior would be filled with oil (olive oil for instance) and the the wick would absorb the oil. The lamp could them be lit, much like a candle would be. Roman Mercury Stone carving from one of the Galic provinces.